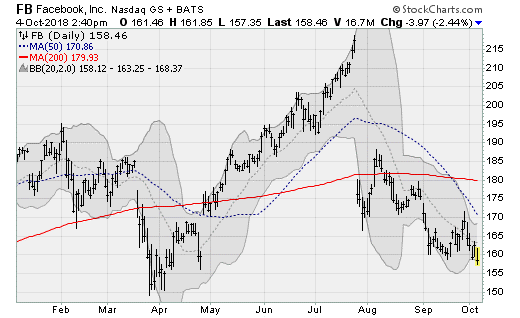 U.S. equities are coming under serious pressure to end the week, with tech stocks in the Nasdaq Composite falling sharply under its 50-day moving average for the first time since April. This comes amid a global bound rout with U.S. Treasury yields pushing past the 3.2% threshold on a combination of red-hot economic data and hawkish commentary from Federal Reserve Board Chair Jerome Powell. According to Stifel analyst Barry Bannister, just one more quarter-point rate hikes would push the Fed’s policy rate to neutral. Something that is likely to happen in December. Thus, any further rate hikes in 2019 would cause rising credit costs to pump the brakes on growth. And that’s why tech stocks are spooked. The runup to new record highs in recent weeks was led by mega-cap technology stocks; now, they are leading the way down. Not only on the reappearance of risk-off sentiment but also on reports that China used a tiny chip to hack into U.S. icons such as Apple (NASDAQ:AAPL) and Amazon (NASDAQ:AMZN). This is expected to harden the Trump Administration’s trade stance against Beijing. 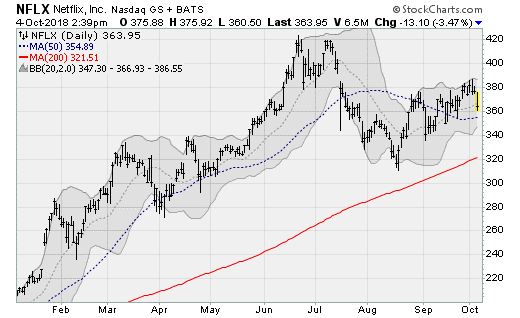 Amazon (NASDAQ:AMZN) shares are falling away from double-top resistance near $2,050 to cut below its 50-day moving average in what looks like the first significant pullback since March. Shares went on to gain more than 50% since then over just seven months. The company has succumbed to growing wage pressure and a tight labor market, raising the minimum wage of its warehouse workers to $15 an hour — something that will pressure margins. The company will next report results on Oct. 25 after the close. Analysts are looking for earnings of $3.06 per share on revenues of $57 billion. When the company last reported on July 26, earnings of $5.07 beat estimates by $2.54 per share on a 39.3% rise in revenues. Shares of Netflix (NASDAQ:NFLX) have been under pressure for months, peaking with a double-top pattern back in June and July amid slowing user growth and worries about rising content production costs. 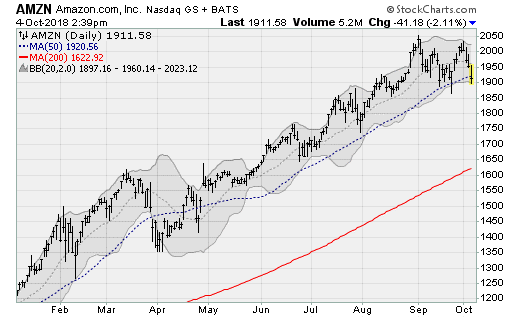 The stock is under fresh pressure on Thursday, falling away from three-month resistance near the $380-a-share level to set up a test of the 200-day moving average and the August low near $320. The company will next report results on Oct. 16 after the close. Analysts are looking for earnings of 68 cents per share on revenues of $4 billion. When the company last reported on July 16, earnings of 85 cents per share beat estimates by six cents on a 40.3% rise in revenues. 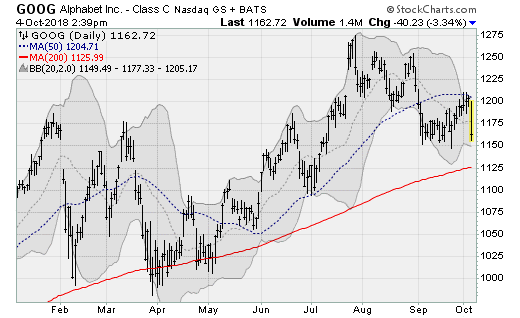 Shares of Google-parent Alphabet (NASDAQ:GOOG) are falling away from resistance near its 50-day moving average and the $1,200-a-share level to continue downward pressure that started in July. Vice President Mike Pence took a swipe at the company in a speech directed against China and its recent activities against the United States, including alleged currency manipulation and intellectual property theft. He called on the company to end the development of the “Dragonfly” app that would make it easier for Beijing to track internet searches. The company will next report results on Oct. 25 after the close. Analysts are looking for earnings of $10.69 per share on revenues of $34 billion. When the company last reported on July 23, earnings of $11.75 beat estimates by $2.05 on a 25.6% rise in revenues. 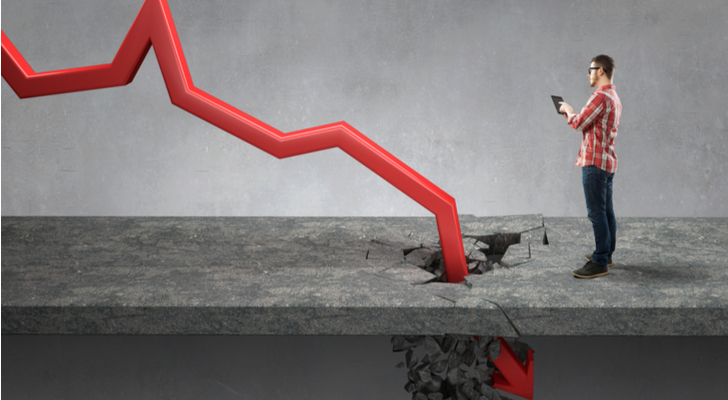 Shares of Facebook (NASDAQ:FB) are suffering a nasty looking technical breakdown from a two-month consolidation range that sets up a test of the March/April lows. Already down roughly 30% from their July highs, shares have been battered by slowing user growth and reports of another security breach. Analysts at Argues lowered their price target on Wednesday. The company will next report results on Oct. 30 after the close. Analysts are looking for earnings of $1.50 per share on revenues of $13.85 billion. When the company last reported on July 25, earnings of $1.74 beat estimates by four cents on a 41.9% rise in revenues. 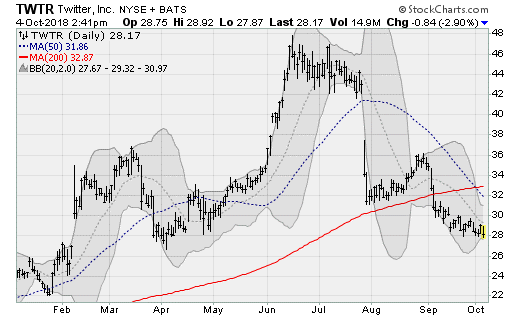 Shares of Twitter (NYSE:TWTR) are grinding further below their 200-day moving average and just suffered a “death cross” with its 50-day falling below its 200-day average. Already down more than 40% from its June high, watch for a move down to the January low that would be worth a further loss of 20%-plus from here. The company will next report results on Oct. 25 before the bell. Analysts are looking for earnings of 14 cents per share on revenues of $699.6 million. When the company last reported on July 27, earnings of 17 cents per share beat estimates by a penny on a 23.8% rise in revenues. Article printed from InvestorPlace Media, https://investorplace.com/2018/10/5-big-tech-giants-getting-smashed/.